"I think Sarah has done a great job of making sure that she understands what the president wants," says Former White House press secretary Sean Spicer says in an interview at NPR with Mary Louise Kelly on Wednesday. "That was a challenge for me at the beginning. [Trump's] an unconventional candidate and president. He's a disrupter, and we were trying to adapt. And I think [Sanders] has done a good job of adapting to what he wants her to do and say and communicate his thoughts," Spicer said. Sanders has been accused of twisting the truth or outright lying in many of her briefings with the press, however, and often obfuscating and dodging questions. She frequently spars with certain reporters, but those are all attributes that Trump appears to appreciate from her. Spicer stirred plenty of controversy and spurred comedic parodies during his brief tenure at the White House of about six months. Famously, he came out and excoriated the press the day after the president was sworn in, when Trump was frustrated by coverage that showed side-by-side pictures depicting his inauguration crowd as much smaller than President Barack Obama's. Spicer boasted that it was "the largest audience to ever witness an inauguration, period, both in person and around the globe." That combative posture set the tone for his relationship with the press, and Spicer said he regrets it. "If you ask me for one thing that I probably want a do-over on, that's it. There was nobody happy with me that night," Spicer recalled. As for Trump's reviews of Spicer's own inaugural outing, he said the president "was very clear that that was not a performance he was pleased with," in part because he wasn't sure what Trump had wanted him to push back on or how to go about it. "I sort of thought I knew what he wanted and went and did it. 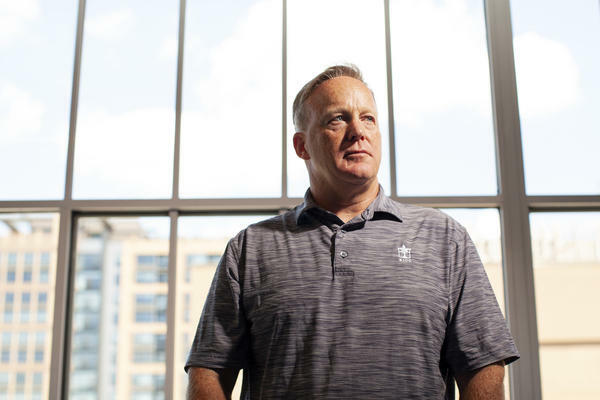 And I'll be honest, if I could have a do-over on that day, I'd take it every day of the week," Spicer said. But one thing he wouldn't take is another trip back to the White House, calling it an "intense, intense job" that is "unrelenting." And Spicer said he doesn't envy his former colleagues as they try to deal with the fallout from Trump's summit in Helsinki with Russian President Vladimir Putin. On Monday, speaking alongside the Russian leader, Trump said Putin's denials that Russia had interfered in the 2016 U.S. elections were "extremely strong and powerful," casting doubt on American intelligence findings to the contrary. The next day, Trump tried to walk back some of those comments, saying he misspoke. Spicer said he is "glad" Trump tried to clarify on Tuesday but laughed that "I'm glad that I'm out promoting a book and not having to deal with that right now." More of Kelly's interview with Spicer will air Wednesday and Thursday on All Things Considered. President Trump and his team have spent the last couple days crafting and recrafting the messaging around that wild press conference with Russian President Vladimir Putin this week. Well, my co-host Mary Louise Kelly spent some time today with the man who was in charge of delivering the message for the first six months of Trump's presidency - former press secretary Sean Spicer. Hey, Mary Louise. MARY LOUISE KELLY, BYLINE: Hey, Ailsa. CHANG: So what did you guys talk about? KELLY: Well, he's got a new book out. And my interest was not so much in sitting down and doing the traditional book interview but in - well, in two things. One, this week, which whatever your politics has been a PR nightmare for the White House. KELLY: And then second, the big-picture question of, as White House press secretary, who do you serve? Are you ultimately responsible to the president or to the American people? So we got into a back-and-forth about that, me and Sean Spicer. CHANG: Let's hear how he answered those questions. KELLY: ...When he or she isn't there to do so. Is it not also to provide accurate information to the American people? SPICER: Sure. But I think that part of it is if you ask what somebody thinks - you know, what's the president feel about this, what does he think about it? - your job isn't to interpret that. It's to say, OK, you asked me how I felt. And if he felt, you know, angry or betrayed or whatever, that's a subjective description that that person can tell you whether it's right or wrong or whether it's based off of something. But if you're asking, why does he think the following - and your job is to say, he believes the following. That's it. KELLY: What I'm asking is when the president says or tweets something that is demonstrably untrue, is your job as his spokesperson to go up and parrot it from the lectern, or is it to correct the record? SPICER: No, my job is to say - if someone says, you know, what is the - you know, and in many cases, as I did say, the tweet speaks for itself. It's not to interpret for him. I don't think - that's not the job. SPICER: That's - but again, it's not - as a spokesperson, you're not up there to play referee. It's to say, this is what he thinks and believes. KELLY: So we had a really interesting back-and-forth about this one, Ailsa, me and Sean Spicer. And I'm going to have the full interview for you tomorrow on the program. CHANG: I'm really looking forward to it. KELLY: Thank you. Thanks, Ailsa. (SOUNDBITE OF THE LIMINANAS SONG, "(I'VE GOT) TROUBLE IN MIND") Transcript provided by NPR, Copyright NPR.